The establishment comprises a total of 326 accommodation units. Guests of the establishment are welcomed in the lobby, which has a 24-hour reception and a 24-hour check-out service. Services such as a safe and currency exchange facilities make for a comfortable stay. Internet access and wireless internet access are available in the public areas. 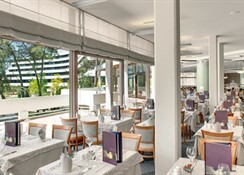 Gastronomic options include a restaurant, a dining area, a breakfast room, a café and a bar. The grounds of the establishment feature a playground and an attractive garden. Additional features of the establishment include a newspaper stand, a TV room and a playroom. Guests arriving in their own vehicles can park in the car park. Among the additional services available are multilingual staff, a childcare service, medical assistance, room service and a laundry. Active guests can make use of the bicycle hire service to explore the surrounding area. A refreshing dip in the indoor or outdoor pool can be pleasantly cooling on hot days. Sun loungers and parasols offer the ideal way to unwind. A hot tub provides an opportunity for relaxation. There is also a poolside snack bar. 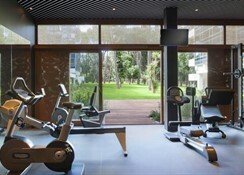 The establishment offers outdoor sporting options, including cycling/mountain biking, tennis, volleyball, basketball, crazy golf and archery, or for a fee, bocce. 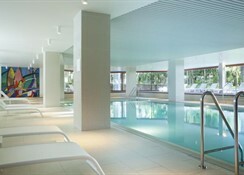 With aqua aerobics and aquafit, the establishment also has plenty to offer watersports enthusiasts. Guests of the establishment can choose from a wide range of indoor sporting options, with a gym, table tennis, badminton, darts, bowling and gymnastics, or for a fee, pool/billiards. The establishment features a range of wellness options, including a spa, a sauna, a steam bath, massage treatments and thalassotherapy. In addition, a beauty salon is available to guests for a fee. An entertainment programme, an entertainment programme for adults, an entertainment programme for children, live music and a kids' club provide guests with recreational options during their free time. 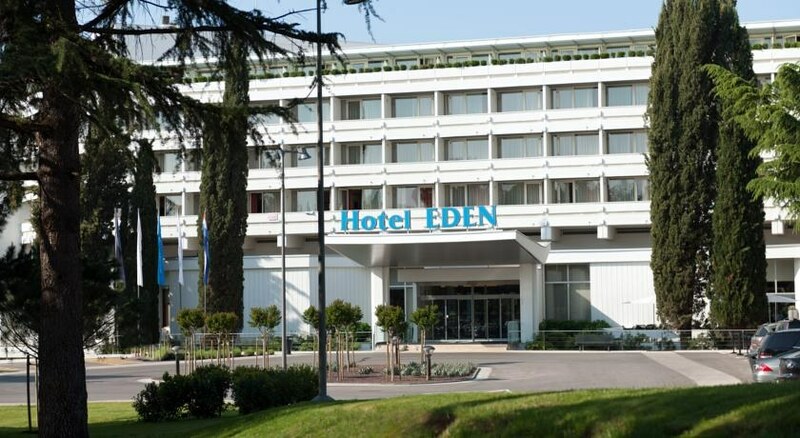 This hotel is located on the edge of a unique and wonderful hundred-year old nature park called Zlatni Rt-Punta Corrente. 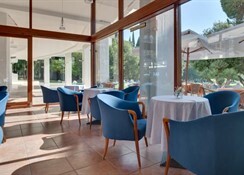 It is situated south of Rovinj, near Zlatni Rt park, 200 m from the sea and sport amenities and 1 km from the town centre. All accommodation units feature air conditioning, central heating, a kitchen and a bathroom. A balcony or terrace is also included as standard. Many of the rooms also offer a sea view, adding to the ambience. The carpeted accommodation units feature a double bed or a sofa-bed. Cots and extra beds are available. Among the amenities are a safe and a minibar. Each accommodation unit offers internet access, a telephone, a TV, a radio, an alarm clock and wireless internet access. Each of the bathrooms features a shower, a bathtub and a hairdryer. The Property is located just 20km from Pulabairport.Taxis arebavailable for hire outside the building next to the bus terminal. Pula taxi drivers are honest but please check the price of your journey before engaging en order to avoid any problem.At the airport the guest can also rent a car at the low level.To reach the hotel from the airport just take the road nº66 (yellow line) and follow the directions to Rovinj.Then look for the hotel sign.